My worst times are when I wake up after a nap. That’s when bad memories come upon me. It just happened again, though the bad thoughts now-a-days are not nearly like they were a couple of months ago. I’ve come to see how I must get up and do something (like the blogging I’m doing now). I can’t afford to lie there too long, When I get up quickly to break free from the ugliness in my head I can escape it before it starts making a home there. Sometimes getting up and writing what I think and feel in my journal helps. Other times I find comfort in doing a Sudoku puzzle. Sudoku gets me thinking about numbers instead of “stuff.” One of my favorite distractions is adult coloring. 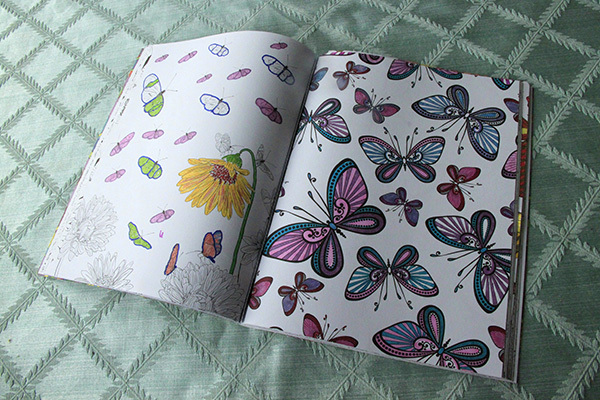 It’s fun and creative to decide on color schemes for the wonderful designs in my book. Coloring takes me into another world, away from whatever might be bothering me. All these activities – and there are dozens more that I can think of – move my mind from the ugly hole I have inside to the surface, a far more pleasant place to be. But I mustn’t wait too long to get going on something. No lying on the sofa for an hour allowing myself to go from bad to worse. I know that with a little effort, I can stop this misery now….and find enjoyment. Do you too have such problems upon waking? How do you find escape?